It is necessary for the patient to stay for a few days following surgery in order to be monitored and for the initial rehabilitation process to begin. A few weeks prior to the operation, you will have a pre-operative assessment here at the hospital. This would include an initial assessment by a physiotherapist. At the pre-operative assessment, a full history will be taken to ensure we are fully informed of your condition. Range of movement of the joint will be assessed, as well as current muscle power. Following this, in depth advice will be provided regarding what to expect after the operation, the rehabilitation process, necessary precautions etc. An initial exercise program will be demonstrated and practiced in preparation for after the surgery. Should elbow crutches or other mobility aids be required after surgery, then this too will be practiced at the pre-operative assessment. After your surgery, you can often feel tired & slightly nauseous following the anaesthetic, and have reduced sensation in the operated limb. This sensation returns quickly in the hours following surgery. 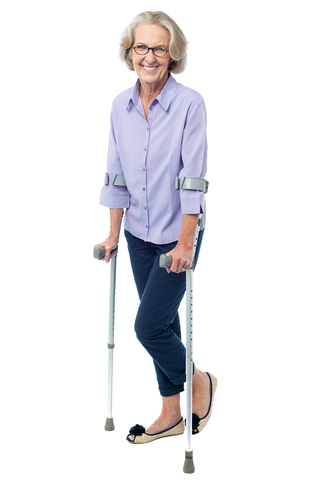 Following Total Knee Replacement Surgery, a physiotherapist will see you later that evening, and help you out of bed. They will also apply ice to help with any pain you may be experiencing. For Total Hip Replacement Surgery & Total Shoulder Replacement Surgery you are routinely seen by the physiotherapist the following day. A physiotherapist will see you twice a day following surgery to ensure maximal improvement. Treatment sessions will include advice, exercises, mobility practice, & stairs practice if required. We will also use ice and electrical stimulation if required in order to get the best outcome following surgery. On discharge from the hospital, on going physiotherapy is often required to continue the rehabilitation process. This will begin in an outpatient setting approximately one week following discharge. Physiotherapy will then be focussed on returning maximum movement, power and function. Find more details on post-operative rehabilitation here. At New Victoria Physiotherapy, a specific Total Hip & Knee Exercise class is available. This runs on Wednesday’s at 1230 in the physiotherapy department gym, and incorporates specific exercises for patients that have undergone a total hip or knee replacement.